The Kempton managing director is Thick, whereas the Killarney MD is Looney. But there’s nothing mad about what’s on offer at the Co. Kerry track. John Looney’s team promotes the track as “the world’s most scenic racecourse” and few would disagree. We were keen to see what changes had been made since our very successful visit to this festival in 2002. Once again Heathrow-Cork and a hire car provided the most cost effective route but Aer Lingus delays meant we didn’t reach our base – the Great Southern Hotel – until 7pm . The Monday card had commenced at 6pm so by the time we’d checked in and got to the track the 5th race beckoned. Entrance was reduced from 18 to 10 euro as a result. The first bets placed were actually in the 6th – a two mile h’cap where we played a couple of 16/1 chances on the tote against the favourite Thunder Road. To our amazement one of our picks Great Quest led all the way for a juicy 33.50 dividend to start proceedings. In between races we bumped into Malcolm Whitehead and a group of his friends from LRC. Malcolm and his party were staying at Foley’s – one of my food choices in town. One of the great things about the races is the proximity to the town centre – just 15-20 minutes’ walk to the track. In the closing Bumper our two selections were Shindig and the debutant Brize Norton. We were always in with a shout as they were half of the quartet that dominated the race; Brize Norton just held on and rewarded us with a 7.80 dividend. A dream start to the holiday. We were too hyper for eating so we just hit the town for some pub music – plenty of it too in nearly every establishment in the centre. Some pubs close at midnight whilst others have later licences – Tatler Jack is a particularly good venue with a late licence and republican songs from excellent musicians. Another evening meeting on Tuesday so there was plenty of time to unwind. Our hotel was equipped with tennis courts (which need an overhaul) and a great leisure centre with swimming pool, jacuzzi and steam room. It was very hot but we managed some tennis before a late pub lunch at The Laurels in town – recommended. Tuesday’s first race looked rather daunting – a 2m 6f h’cap hurdle with 17 runners. However some people thought there were 15 runners, as two had incorrectly been named non-runners. The bogus n’rs were value on the tote as a result and became two of our three bets in the race. This was getting silly. One of the “n’rs” – Rosamio - led all the way and hacked up by 5 lengths. S.P. 12/1, tote 25.10. Incredibly we had backed three consecutive race winners at 32/1 13/2 and 24/1. Surely our luck would change? And of course it did. No joy in the next five races so we decided to leave before the closing 5-runner maiden, which looked likely to go to Fallon on Watchman’s Anna Karenina. Before Keiren was in the winner’s enclosure we were in Cucina, a small Italian restaurant you will find if you leave Ladbrokes by the back door. Run by a friendly antipodean Italian. Sea bass for me washed down with a fine Pinot Grigio. We beat the Fallon fans to it as the place filled up whilst we were enjoying our main course. Another excellent restaurant to add to the list. Wednesday evening proved to be blank in terms of winners but not incident. It was still very hot and many people were taking advantage of a tap dispensing drinking water under the main stand. We were rather stunned when someone suddenly ripped down the sign advertising the facility. It was the bar manager who was clearly losing sales. This didn’t satisfy him though as he tried to remove the tap altogether with a spanner. 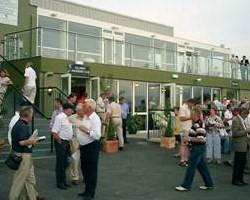 My friend Adrian confronted him and subsequently reported him to racecourse management and St John’s Ambulance service. He would have been in big trouble if anyone had collapsed because of the heat. The tap functioned for the rest of the evening but was removed overnight – we can only speculate that it was the bar staff – very irresponsible behaviour. Actually the beer choice at the track was not great – Murphy’s or that dreadful Coors stuff was all that was available on draught. Why do the Irish like all that American rubbish – Coors, Miller, Bud etc.? As for racing our highlight of the evening was watching Ryan Moore at Kempton in the Ladbrokes’ shop come from last to first, passing four horses in the last 100 yds, to get 9/4 favourite Logsdail up by a neck. Not that we backed it but we are on Ryan at fancy prices for the jockeys’ championship so it was good to see him in such great form! The biggest plunge of the night was on Heartstopper, hot favourite for the 15-runner Ladbrokes Handicap Chase. The AJ Martin/R Walsh combination proved unsuccessful as Heartstopper’s heart was never in it. The final day saw a change of format with the card commencing at 2.15pm . All the girls were out in their finery as Rosanna Davison was there to judge the “best turned out”. As it happens I had a bit of a touch with Rosanna. And no I don’t mean physical contact – I backed her to win Miss World in 2003, which of course she did. On the racing front Jessica Harrington’s The Last Hurrah won the Dawn Milk Run Handicap Hurdle to earn a tilt at the Galway Hurdle. 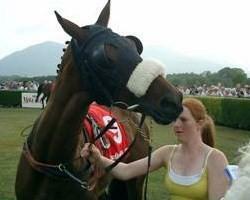 The race has produced two previous Galway Hurdle winners so it will be interesting to see how he gets on. We had no joy until the final race – the Bumper – so often a good medium for us. We played two against the field in this competitive 7-runner. A little on WP Mullins’ second string and considerably more on the newcomer A Little Different. The latter was under the persuader big time a mile from home and looked out of it. 50s on Betfair I would imagine. And yet as they ran up the home straight he suddenly got the hang of it and came between horses to win by a neck. An unbelievable finish to the festival and a 7.80 dividend to turn the day around. As the winner was only racing for half the race there may be better to come from CA Murphy’s debutant. Three winning days out of four and an overall profit. The earlier finish gave us time to drive out to Nick’s Restaurant in Killorglin some 22km from Killarney. This proved to be the meal of the holiday and one of the best meals we’d ever had in Ireland . I had exactly what I’d ate and drank in 2002 – a prawn and monkfish number accompanied by the house Sauvignon Blanc. A wonderful atmosphere with resident pianist and guest singers. If you go try and book a table on the ground floor to get the full impact of the entertainment. Friday saw us driving back to Cork airport – however not before a detour for lunch in foody Kinsale. A random choice of Jim Edwards’ pub and a really excellent seafood lunch washed down with Kinsale Cream Stout – the best drink of the holiday. Think Porterhouse and a pint of plain. Magnificent.